This one gives me a strange feeling of Deja Moo. "The odd sensation that I've heard this bull before." John Hancock: We know you love him, but if he dies, we give you a summer home and two Mercedes-Benzes. Wouldn't that be nice, too? 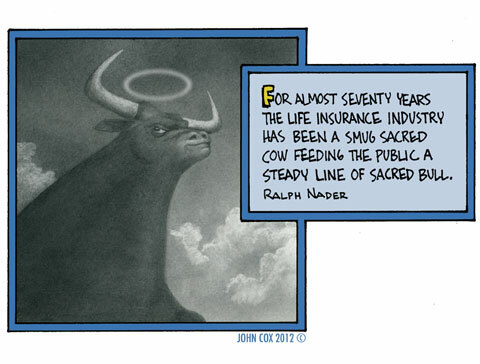 Maybe the first person who reforms the insurance industry would be award the No-bull prize? With insurance, you can be worth far more dead than alive. This page contains a single entry from the blog posted on April 6, 2012 3:10 PM.